1. Pick a Location that appeals to you. Is there someplace you've always wanted to go? What better way than to spend the time there doing something you love in the company of other artists? 2. Look at the organization of the workshop. Is transportation or organization at painting sites included? or will you spend precious painting time driving around looking for places to paint? Or better yet, looking for the class? Is the class limit reasonable , or will you be vying for attention with 20+ other participants? Is the painting schedule flexible to allow for non planned opportunities? 3. Look at the work of the instructor. Does the work represent a direction you would like to go in? or perhaps try something new to give your work a jump start? A workshop is a place to try new techniques and ideas. If you approach the workshop starting in doing what you've always done, the way you've always done it, you defeat the purpose of the new experience, saturated in creativity. A workshop is not a place to show off your skills. I ask my students to begin a journal 3-4 days before the workshop and continue it for at least that long after they get back home. The journal should be something you keep for yourself. Don't use this as a textbook, be personal. Write down your goals for this workshop. This will enable you to relive your workshop experience when you need your memory jogged. 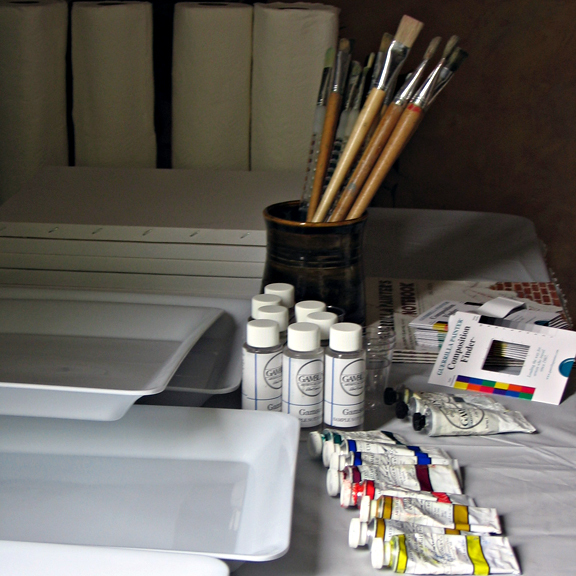 Record your travel, your painting locations and any demos your instructor may do. Sometimes it's the little things you may miss that makes a difference. No such thing as a silly question at a workshop. And the person next to you may have the same question. If your instructor specifies that you use ( for example) the exact pallette that they do, you're not getting individual attention. An instructor should meet you ''where you are' in terms of your painting knowledge. This is not to say a beginner or someone looking for guidance in buying supplies should not take instructor's suggestions. Some fantastic painters are not necessarily good instructors. You've all seen classes of 'cookie cutter' students where you can pick out the instructor by looking at the work the class has done. Rarely do you have the opportunity in a creatively charged atmosphere where you will eat, sleep and breathe painting. The osmosis in such an adventure is amazing! Take the time to know your fellow students, some of the most enduring friendships are born in a workshop. If your goal is to come away with finished paintings, you're going to miss a lot of stuff! It's tempting for all of us to do this. A. You may not be experienced painting outdoors and may be overwhelmed by the information in front of you. Give yourself some slack time to adjust. If you have normally painted in a studio, you will now be doing problem solving 'on your feet'. Don't let your struggle be with inferior student grade paints and supports. Buy a few good artist grade materials instead of a store full of cheaper supplies. C. If you put your energy into 'finishing', you're missing your next great painting. It may very well be your "AH HA" painting! tools that you will have the week after you get home, and the week after that, when you're problem solving on your own. 13th Annual "Day in an Artists Studio"
Sign up for a one day 'Mini Holiday"
or someone on your friend list. a DAY IN AN ARTIST'S STUDIO features a warm inviting cozy fire,light lunch and gourmet coffee, teas & all supplies provided to create your own oil painting. I teach how to use your creativity to relieve stress. EVERYONE is creative !! Come spend a creative relaxing day with us ! Sign up with a friend and give yourself the gift of time. 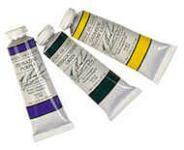 Oil paints made with walnut oil. "Those "wow" moments, when Baldini is full of passion for the light and colour a day can bring -- regardless of the weather or the time of year -- has fueled her art for more than 30 years and has earned her the respect of other artists, nationally and internationally, for her ability to produce works embracing special moments and places in the outdoors. "I don't want a perfect world," said Baldini in a studio with walls full of paintings of the Niagara Falls area, including the rapids of the famous river and its cataract, and of other regions of Niagara and the rest of the world, including Portugal, Spain, the Bahamas, Honduras and Yucatan. "If all we had were all blue skies and sunshine, that would be boring. "Baldini is offering everyone from beginners to those will some experience in applying oil paints to canvas anything but a boring time at a workshop she is hosting at the Lundy's Lane studio this Sunday. That workshop, called Day in an Artist's Studio, runs this Sunday, Feb. 10, with coffee and Danish treats in the morning, a lunch and all materials, including canvas and paints provided, for a fee of $65. "I am asked frequently to do weekly lessons at my studio," Baldini said. "I made the decision a few years ago, that people learn and absorb much faster when completely immersed in a project. "As a host and mentor at the workshops, Baldini said she always finds them as rewarding as those who attend hopefully do. Often from someone who is just starting out in art, she said, she is reminded of the virtues of keeping things simple in some of her own work. "I've had complete beginners in my classes," she said, "and I have learned from them." Baldini's approach to art is something she said is described as "Plein Air Artist" or one who chooses to paint from life outdoors. "This often means painting in the fog, mist or frozen landscape of this beautiful peninsula," she explained. "Plein Air Painting is a metaphysical skill capable of creating an image that lets the viewer 'be there in the moment' when viewing the painting. "An upper New York State native before moving to Niagara Falls more than thirteen years ago, Baldini is the founder and signature member of International Plein Air Painters (an organization of artists dedicated to producing painting of moving outdoor settings around the world) and in 2002 established the first Worldwide Paint Out, that brings groups of artists together through the internet each year to share their work. contact Jacqueline Baldini at her studio on 7973 Lundy's Lane in Niagara Falls at 905-354-8692 or 1 800 393-7270 or visit her website at http://www.artworkshops.homestead.com/. 2019 class closed - see you next year !